Analog Way is exhibiting at ISE 2017 in Amsterdam from February 5-9, 2017, at booth 3-C95, where the company will showcase a new set of optional interfaces for the VIO 4K, including features able to support 4K60 4:4:4. The new optional modules also offer the possibility of benefiting from up to nine inputs and three independent-scaled outputs, including two in 4K60 4:4:4, along with the capability to input/output up to eight audio channels from/to a Dante audio network. Through a new set of expansion modules, the VIO 4K goes beyond its conversion capabilities to be a multi-format converter that simultaneously supports 4K60 4:4:4, DisplayPort 1.2, and 12G-SDI. AV professionals are now free to choose how they would like to equip their VIO 4K depending on the interfaces and features they really need. Designed to provide flexibility, the VIO 4K stretches the limits of image quality while providing true 4K60 4:4:4 to fit with the increasing 4K demand. By utilizing the new expansion module especially designed for Analog Way’s multi-format converter, professionals can now experience the highest image quality and thus enhance the quality of their content. Analog Way’s powerful conversion tool can output up to 26 million pixels. 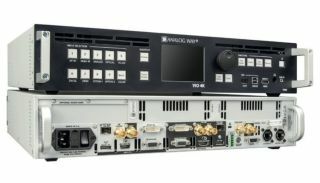 The optional interfaces also increase the many different possible applications of the VIO 4K. With all options, the VIO 4K features up to nine inputs and three independently scaled outputs. In terms of configuration, the three outputs provide a wide flexibility in order to reach more creative displays while using 4K. Not only does it enable the user to process one source simultaneously to the three outputs at any given moment, but it also allows the user to configure each video delivery of the selected source such as scaling, resolution, or color settings. The new set includes a module that is able to support Dante technology in order to input/output up to eight audio channels from/to a Dante audio network. Equipped with the Dante interface, the VIO 4K makes it easier to extract any kind of audio content from a video signal to integrate into a network and vice versa. As audio and video content are processed separately, audio content can be easily adjusted.